Yacht Brokers Gibraltar Ltd. was founded in 2012 by Gerard van Leest after he had spent over ten years in the yachting industry. All Yacht Brokers Gibraltar’s exclusive charters begin and end in Gibraltar. Here, Gerard offers some tips on what to see in the south of Spain. Set below the foothills of the stunning Almijara Mountain range, and with views out to the Mediterranean Sea, Nerja is a popular destination for young and old alike. This one-time fishing village, situated about 45 minutes east of Malaga airport, is the largest resort on the eastern Costa del Sol and remains somewhat unspoilt compared to its western counterparts. Nerja has resisted the influx of high-rise apartment blocks in favour of a more traditional and relaxed atmosphere in a typical Spanish environment. The winding cobbled streets of the whitewashed old town all lead to the Balcon de Europa (named by Spain’s King Alfonso XII on a visit in 1885)– which offers a palm lined promenade leading to a spectacular viewpoint carved out of the rocky headland. Relax in one of the bars that surround the square or wander down to one of the coved beaches that lie below the headland. Here you will also find the beautiful Iglesia del Salvador church where, if you are lucky, you may see one of the many Spanish weddings that take place here over the course of the summer. Nerja has a good selection of beaches as well – from the Playa Torrecilla, located adjacent to the town centre, to the popular beach resort of Burriana, located to the east of the town with its selection of bars restaurants and beach front Chiringuitos. Nerja has a population of around 20,000, with approximately 25 per cent of these inhabitants being foreign residents. This fact is reflected in the choice of restaurants in and around the old town – choose from tapas, French, Italian, Indian, Greek, English, Chinese, and, of course, typical Spanish offerings. For the young, and young at heart, Nerja offers a good selection of bars and nightclubs mainly gathered around the Plaza Tutti Frutti and nearby on Calle Antonio Millon. Alternatively, for those of you looking for fine dining, there are plenty of excellent places to end those summer evenings in style. Just four kilometres inland from Nerja, clinging to the lower slopes of Monte el Fuerte, lies the pretty little whitewashed village of Frigiliana. In this ancient Moorish settlement where originally only those Moors who converted to Christianity were allowed to live, you will find a maze of geranium and bougainvillea-adorned cobbled streets that wind endlessly upwards. Much of the town’s history can be learned from reading a series of ceramic plaques posted about the streets. Steeped in history, this beautiful village is a haven of tranquillity and tradition that is truly appreciated by the locals, making it the most honoured town within the Axarquia province. 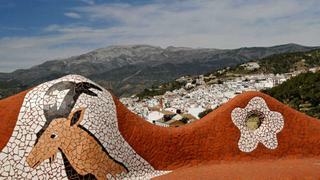 In the 1980s, the town was awarded by the tourist department of Spain 1st prize for the most beautiful place in Spain. An early contribution to this was the law introduced by the incumbent mayor in 1971; he declared that everyone in Frigiliana must whitewash their houses once a year – a law that is still enforced today. 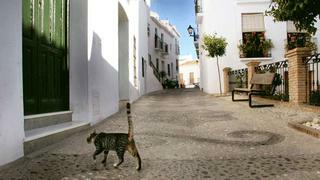 Due to its unrivalled charm, Frigiliana attracts a vast number of tourists during the summer months. Sunny summer days can be spent enjoying a light refreshment in one of its numerous bars and cafes, taking in the sights of some of its enduring processions and fiestas, or exploring the area by taking a walk through olive groves, avocado plantations and lines of almond trees. Only a ten-minute drive from the beaches of Nerja and Maro, Frigiliana enjoys stunning views down to the coastline, many fine restaurants offering local dishes such as ‘choto con salsa almendras’ (kid in almond sauce) along with many good shops selling local wines and craft items. The bay of La Herradura is a fishing village-resort suburb of Almunecar and one of the prettiest bays along the southern coast of Spain. Together they form the main tourist area of the Costa Tropical, which lies between the Costa del Sol to the west and Almeria to the east. Unlike most resorts, development has been limited here and height restrictions are in place to maintain its traditional Spanish aspect of whitewashed buildings climbing up the hill from the beach. Along the length of the bay many beach bars can be found as well numerous companies offering various varieties of water sports and equipment hire. Divers will find this area of particular interest too. In recent years, La Herradura has expanded eastward along the coast towards the next headland of Punta de la Mona. This gives great views of the spur of Almunecar and its castle. Protected by the bay of Punta de la Mona is the pretty harbour of Marina del Este, which can be considered as one of the most beautiful in the Mediterranean. Here you can enjoy a relaxing meal at a variety of waterside bars and restaurants. Competa sits about 650 metres above sea level in the Sierra Almijara and a 30-minute drive from the beaches of Torre del Mar and Torrox Costa. From its pretty white houses and flower-lined streets are spectacular views out to sea as well as beautiful vistas of the mountains and Andalucian countryside. Originally a Moorish settlement, the town retains a relaxed atmosphere while offering all that is required for contemporary living; banks, bars, restaurants and shops. Competa’s focalpoint is its charming main square known as Plaza Almijara, which sits beneath the lofty bell tower of the 16th century church of Nuestra Senora de la Asuncion. Here you can relax and soak in the tranquillity of the village while enjoying a refreshment in one of its bars or restaurants. On August 15th each year the village holds its annual fiesta ‘Noche del Vino’ when hundreds of barrels are rolled through the village and local revellers gather to sample as much of the free vino made from the local Muscatel grape as they can manage.